Melissa Spilsted is the director of Hypnobirthing Australia™ and teaches hypnobirthing techniques to parents (hypnobirthing Brisbane & hypnobirthing Gold Coast) and practitioners throughout Australia and the world. Melissa Spilsted is very well known for her childbirth hypnosis albums (available through this website or iTunes) – the most popular being ‘Surge of the Sea’. She brings to her hypnotherapy and hypnobirthing classrooms 20 years of training experience and professional qualifications. In addition to this – Melissa has successfully used hypnobirthing techniques three times herself and has had three beautiful, peaceful and calm natural births! Based on her success in delivering hypnobirthing in Brisbane, hypnobirthing Gold Coast and via Skype over a number of years, combined with her personal and professional teaching, voice training and clinical hypnotherapy experience; Melissa has developed the Hypnobirthing Australia™ Program that incorporates modern, contemporary training resources and professionally recorded Australian practice albums. 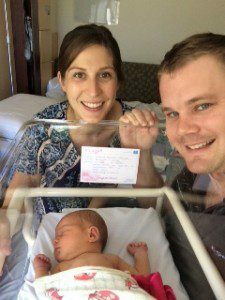 This course is uniquely designed for contemporary Australian families and systems of maternity care and has become the fastest growing childbirth education course in Australia! Melissa is a certified Hypnobirthing Practitioner & Childbirth Educator (HPCE), a registered Teacher (B.Ed, B.Arts), a Clinical Hypnotherapist (CHt Clinical Member of the AHA), a member of CAPEA (Childbirth & Parenting Educators Australia), has appeared on Channel 7 Sunrise, written for Mother and Baby Magazine, appeared in Practical Parenting Magazine & The Australian Woman’s Weekly, lectured midwives and midwifery students in local universities and hospitals and her work has been showcased at the Royal Society of Medicine in London. As a highly trained and AHA registered Clinical Hypnotherapist, Melissa is unique in also being qualified to offer Private Health Fund Rebates for many funds. Melissa offers hypnobirthing sessions for both natural and caesarean birthing. She is a passionate advocate for natural birthing; but also recognises that sometimes the safest delivery for mother and baby is via c-section. In addition to being one of Australia’s most popular and recognised hypnobirthing instructors, she has pioneered a special course to prepare parents for caesarean birth which is receiving national and international acclaim. “When pregnant with my first child, I must admit that I was quite fearful of the perceived ‘pain’ associated with labour and childbirth – everyone I met seemed to have a horror story to tell. When my husband and I attended antenatal classes they passed an epidural needle around the group – it was HUGE. I then read up on the different drugs offered during labour and was horrified to learn of the documented side effects for both mother and baby – not to mention the unknown ones. I decided that there had to be another way. Women had been giving birth since the beginning of time – our bodies are so remarkably complex and well designed – I found it hard to believe that the childbirth process was so flawed! I recognised the power of the mind-body connection and wished to utilise that for my birthing. That is when I discovered Hypnobirthing. I was a bit sceptical at first, but thought I would give it a go. With only three weeks to go before my due date, my husband and I learnt hypnotherapy and hypnobirthing techniques for birthing. Thank goodness we did! I did really embrace a hypnobirthing philosophy, but I found the practice cds (in another accent) to be sometimes difficult to listen to – so I made my own recordings and incorporated some of my own conditioning/breathing techniques into my daily preparation. My births were beautiful, smooth and calm and I attribute this to the knowledge that my husband and I had acquired about the birthing process, hypnobirthing techniques learnt, support from my birth partner and my own program of ‘conditioning’. I believe so strongly in the positive outcomes of using hypnobirthing that I now completely focus my hypnotherapy and teaching practice on sharing these techniques with parents and training new Hypnobirthing Australia Practitioners. I am very proud to know that I have made a positive difference to many family’s lives through education and the sharing of this these techniques. Melissa passionately believes that it is a woman’s birthright to have a positive birth experience; which will have far reaching effects on parenting, relationships and self-esteem. Knowledge is power! Melissa herself is a mother of 3 sons (all Hypnobubs). Clients find her style of relating and helping to be very honest, down-to-earth, nurturing, gentle and warm. Melissa holds both group and individual hypnobirthing classes and hypnotherapy sessions servicing the Gold Coast and Brisbane. Melissa provides hypnobirthing training to midwives, doctors, hypnotherapists & childbirth educators all over Australia and the world to become Hypnobirthing Australia™ Practitioners. Our aim at Hypnobirthing Australia™ – is to make hypnobirthing accessible to families all throughout Australia. To begin your own positive hypnobirthing experience, please feel free to contact us!